Modern Gardener: The Amazing Corpse Flower Blooms At Eden! The Amazing Corpse Flower Blooms At Eden! A Titan Arum (Amorphophallus titanum), also known as the corpse flower, was in full bloom at the Eden Project in southwest England in this picture released by the Eden Project February 5, 2007. (Steve Bedser/Eden Project/Reuters) This Rarity hardly ever blooms in captivity let alone in winter. A mature, bucket-shaped corpse flower emerges from a huge underground storage tuber once every one to three years. Producing that enormous, frilly inflorescence takes a lot of effort. In young specimens, and in non-flowering years, the plant unfurls a single leaf which can reach the size and appearance of a small tree with many "leaflets." However, in preparation for just a few days of flowering, the plant must shed its leaf and sit dormant for up to four months to muster its energy reserves. The "flower" is in fact a structure known as an inflorescence. 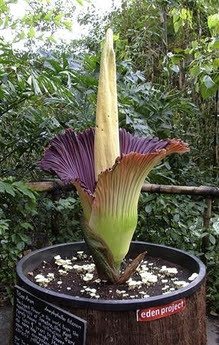 In members of the Aroid family, the inflorescence is composed of a petal-like outer spathe, and the spadix, a central column dotted with hundreds of inconspicuous flowers. A mature eight-year-old captive titan arum, Amorphophallus titanum, typically reaches six feet (1.82 meters) tall. However, in May, one inflorescence in Bonn, Germany, produced a breathtaking (perhaps literally) bloom nearly nine feet (2.74 meters) tall, setting a new record for size. The previous record was set in 1932, when an inflorescence in Wageningen, Holland, reached 2.67 meters in height. Reports of inflorescences larger than this have appeared over the years, but there is no evidence to support these claims, said Wilhelm Barthlott, director of the University of Bonn Botanical Garden. The Bonn plant's enormous tuber now weighs 176 pounds (80 kilograms). "Constantly in the literature there is a false transcription of feet into meters," said Barthlott, but many measurements also include the height of the tuber, instead of the height from the soil surface, he said. Measured this way, the Bonn flower would be over 11 feet in height (3.40 meters).